AUGUSTA — Gov. Paul LePage last year vetoed a measure to bar the state from asking most job seekers about criminal convictions on the applications they initially submit. With LePage no longer an obstacle, legislators are eyeing the same bill as one way to help formerly incarcerated Mainers overcome their pasts. The so-called “Ban the Box” proposal, adopted in at least 30 states, would prohibit the state from putting a check-box on most job applications asking candidates about criminal history. Doing so would allow more applicants with criminal histories to make it past the initial weeding-out process and give them the chance to make the case that their record should not disqualify them from the position. It’s an idea for which the Legislature has already shown support. Last year, the same bill passed the Senate by a 30-2 margin and twice won majorities in the House, with an 81-61 tally the closest margin. The measure allows applications for some jobs to continue asking about criminal history. For instance, anyone seeking to become a state trooper would have to answer the question because those with past convictions are not eligible for the position. The bill would not apply to job applications with local governments or private employers, though some states have taken that step. Peter Lehman, a founding member of the prisoner advocacy coalition, urged the Committee on State and Local Government to endorse the proposal, which matches the wording of one LePage shot down in July 2018. “What I hadn’t realized was that I had received a life sentence,” Lehman said. In the years since, he said, he put in “a lot of very hard recovery work” to become a professional sociologist and criminologist with a doctorate degree. They need a chance to move on with their lives, he said. Advocates point to a handful of studies that lend support to the position that abolishing the criminal conviction on job applications leads to more opportunity for former prisoners. Supporters said that postponing consideration of criminal pasts gives those who were once incarcerated a chance to explain what they’ve done to overcome an obvious problem. Asking about convictions on applications serves “as a screen that artificially weeds out qualified workers when employers ignore applications with the checked box, despite the applicant’s skills and qualifications or how relevant the conviction is to the position being applied for,” said Adam Goode, the legislative and political director for the Maine AFL-CIO. “A fair-chance policy benefits people who work to provide for their families and their employers through ensuring a fairer decision-making process by considering how related the conviction is to the job at hand, the amount of time passed and evidence of rehabilitation,” he told legislators. Making the change would also help alleviate racial imbalances in hiring. When he vetoed the bill last year, LePage said he supports “hiring outside the box” and urged employers to “consider a wider range of candidates” to fill positions, including people with criminal convictions. Moreover, the former governor said, changing state job application forms would require changes and updates to computer systems and programs that would cost Maine taxpayers. Holly Pomelow, the acting director of the Maine Bureau of Human Resources, testified this week, however, that the cost of making the change would be minimal. The only New England states that haven’t passed “Ban the Box” legislation are Maine and New Hampshire. Three New England state — Massachusetts, Rhode Island and Connecticut — have gone a step further than the one Maine is eyeing. They have also barred private employers from asking about criminal records on job applications. Many large companies, including Walmart, have adopted the same policy voluntarily. Among the legislators supporting the bill are Rep. Bettyann Sheats, D-Auburn, and Sens. Nate Libby of Lewiston and Shenna Bellows of Manchester, both Democrats. 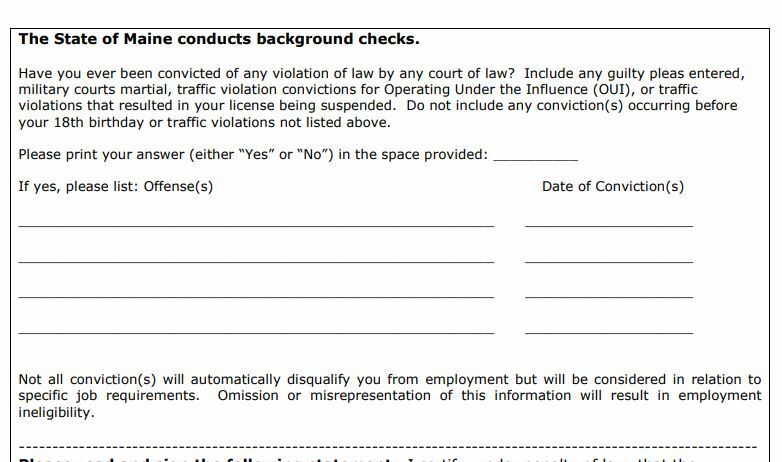 Maine’s standard employment application for a state job includes a section asking prospective employees about any criminal history. A bill before the Legislature would drop the section from most state employment forms.